I used China Glaze OMG as a base, and used a water marbling technique with two other China Glaze holographic polishes, China Glaze DV8 and China Glaze L8R G8R, a teal and green, respectively. Topped it off with 2 coats of Seche Vite top coat. Holla! :-P I'm such a dork. I like, I think this is something I would be brave enough to wear (and I don't wear polish)! That looks gorgeous! I need to add some true holos to my collection! Your Holla made me laugh I like it and if that makes me a dork too then so be it! Beautiful mani! 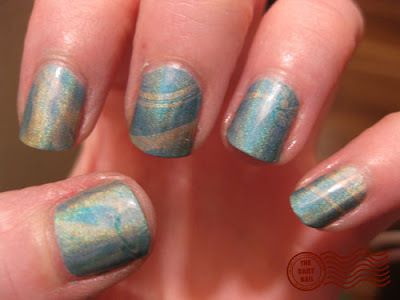 LOVE the water marbling with the OMG! holographic polishes! I have a Konad design in OMG today and LOVE it. Those holographic polishes are awesome! Gorgeous! I don't typically paint my nails-- I work with my hands and I can't avoid the chipping-- but if I could figure out how to do that on my toes, I'd be a happy camper. So pretty! I went to sephora today too! Oh please please please share your marbling technique! Inquiring minds want to know! 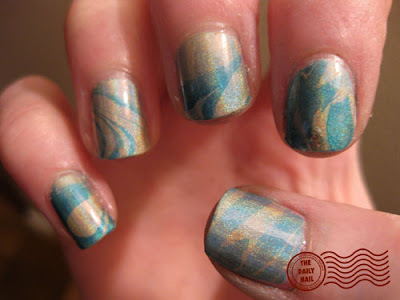 This post totally inspired me to try marbling on my fingernails, even though I'm a spaz with painting them. I found a couple of tutorials on youtube, and it was so much fun, and really not very difficult at all. I have a new addiction. Love your blog! Wow, I'd like to show my daughter how to do that, because she is starting to be curious about all this kind of stuff, but I am afraid my hands were always so shaky I could never manage to do it. since the first time that I found this site, there's something that I wanted to tell you, I love the expression in your face in the picture. I'm totally in love with Holographic polishes..